Gonna start this blog with a news release, like I often do, but then there is more to the story. . . .
LINCOLN, Neb. 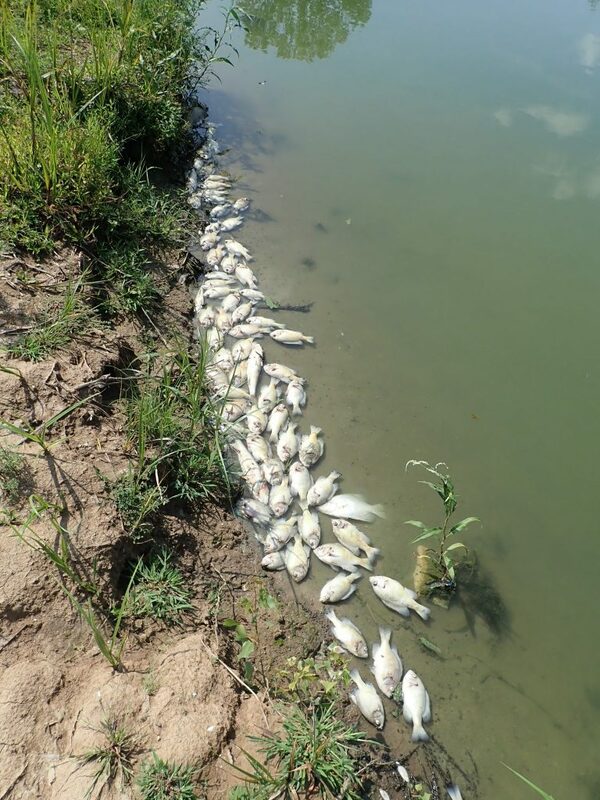 – Low oxygen levels have caused a major die-off of fish at Olive Creek Lake, according to the Nebraska Game and Parks Commission. The remaining fish population is suspected to be small. 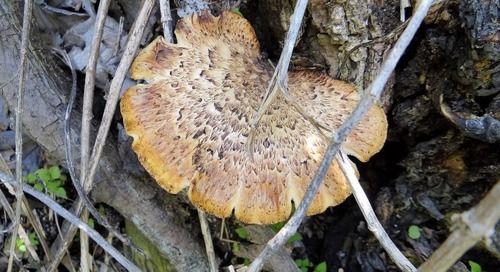 The die-off was reported by the public and investigated by Game and Parks on Aug. 16. Game and Parks staff found extensive numbers of dead largemouth bass, bluegill, channel catfish, black crappie, saugeye and black bullheads. Dense algal blooms in the lake over the past several weeks, combined with slight wind and wave action, resulted in low oxygen levels. Only the top several feet of the water contained oxygen capable of supporting fish. Visitors to Olive Creek State Recreation Area would find a shore ringed with dead fish. Angling is not recommended since success likely would be poor. 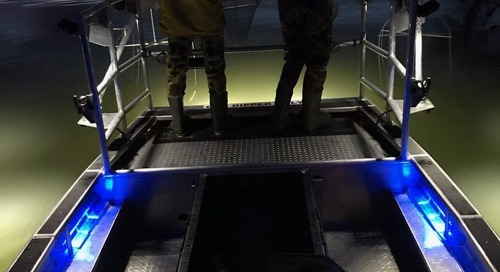 Daryl Bauer, Game and Parks’ fisheries outreach program manager, said conditions for a continued die-off may exist and any fish currently remaining may be stressed. An evaluation of the fish die-off and remaining fish population will be conducted later this summer or fall. Restocking likely would not take place until 2019, since most of the fish being raised in state fish hatcheries are designated for other waters. I was out to Olive Creek late last week. I am afraid the fish die-off was extensive, major. There were lots of dead fish, everywhere. I saw mostly dead bluegills, LOTS of dead bluegills, but also crappies, largemouth bass, some saugeye and even a dead bullhead or three. Bullheads are able to tolerate poor water quality better than other species of fish, so when you see dead bullheads, well, it ain’t a good sign. The news release is correct in saying that low oxygen levels caused by an algae bloom is what caused the die-off, but let me explain that a little more. Algae are plants, microscopic plants. There are a whole variety of algae that are present in our waters all the time. At different times of the year, under different conditions, different types of algae do best and “bloom”. 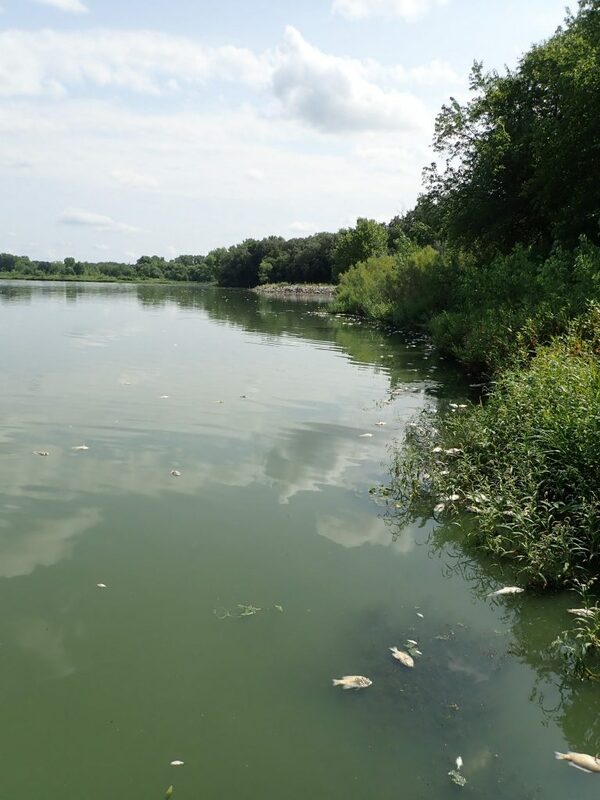 There may be a progression of different types of algae blooming at different times throughout the year on a Nebraska waterbody. Bluegreen algae are the type of algae most likely to bloom during the heat of summer. High water temperatures, lots of sunlight, and an abundance of phosphorus tend to fuel bluegreen algae blooms. Yes, some species of bluegreen algae can produce toxins under some conditions, BUT those toxins do not affect fish. Toxic bluegreen algae do NOT directly kill fish. 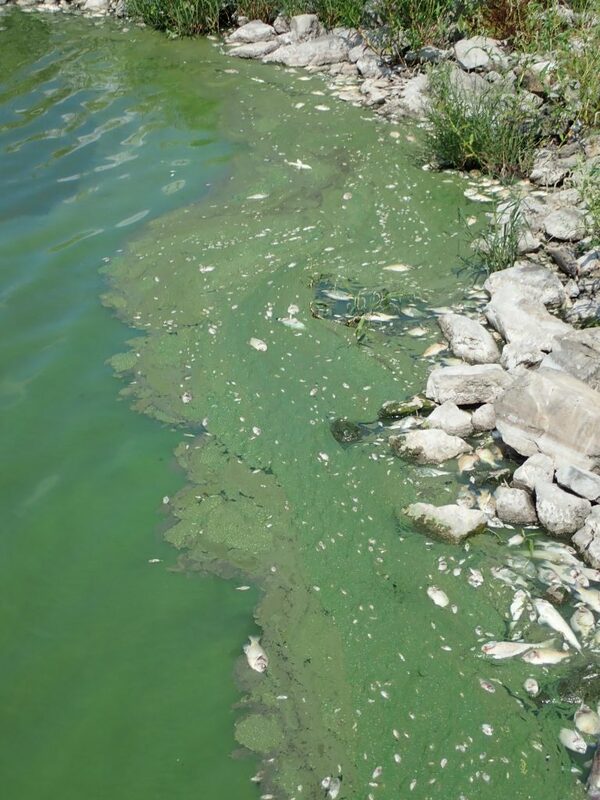 However, heavy blooms of bluegreen algae can indirectly cause fish die-offs, commonly called “summer kills”. This happens because those algae are plants, and yes, plants produce oxygen via photosynthesis when the sun is shining. After dark, or when the sun is not shining, those plants, those algae, respire and use oxygen. With severe blooms of algae the amount of oxygen used during the night can be enough to cause an oxygen sag which indirectly kills fish. If you notice in the pictures, yes, there is a heavy bloom of algae at Olive Creek Reservoir right now, bluegreen algae. A couple days of cloudy, relatively calm weather during the height of an algae bloom is not good either. Without clear skies there is less photosynthesis, less oxygen production, and with calm weather there is less mixing of the water. No doubt a few days of cloudy, calm weather the past couple of weeks made the situation worse. 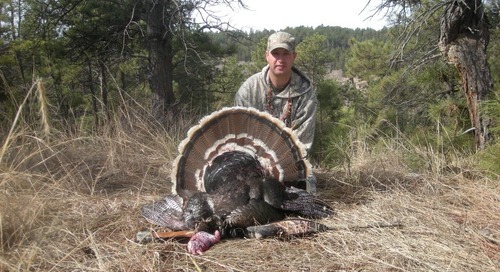 I have not heard of any other public waters where we have had summer kill conditions in the past week or two, but I have heard of some private ponds that have suffered similar fates. So, can anything be done to prevent these algae blooms and subsequent fish kills? Well, there is not an easy solution. Fertilizers feed plant growth in the water just as on land. Nebraska’s geography and soils are highly productive to begin with; that is one thing unique about our great state–it is a fertile place! There is not a waterbody in Nebraska that is not productive, does not have an abundance of nutrients like nitrogen and phosphorus. In addition, land use can add additional nutrients to our waters; runoff carries sediment and nutrients from the watershed into creeks and rivers and ultimately into reservoirs. You better believe that a reservoir the age of Olive Creek has LOTS AND LOTS of nitrogen and phosphorus accumulated and available, and during the summer that fertility is going to fuel blooms of either rooted aquatic plants or in this case, algae. Yes, Aquatic Habitat Rehabilitation projects like the one done a few years back at Olive Creek can mitigate the problem by removing nutrients, binding them and making them unavailable for “circulation”, or by favoring the growth of rooted aquatic vegetation over algae. You bet we knew all of this when the project was done at Olive Creek, but there are limitations to what can be accomplished on any of our rehabilitation projects and we were not able to do as much at Olive Creek as we would have liked when that project was done. Since we are experiencing fish kills now, does that mean the Olive Creek Rehabilitation project was a failure? I would argue NO, not a failure by any means because what we accomplished there was better than doing nothing, and we bought several years of good fishing with the rehabilitation project that was completed. Yes, we would liked to have done more and maybe we can address some of those shortcomings in the future, but what was done was a long shot better than doing nothing. Certainly what I saw at Olive Creek Reservoir last week would indicate that the fish kill was extensive, but I will tell you that often these events do not eliminate all the fish. We will have to do some sampling at Olive Creek, probably yet this fall, to see what, if anything, survived. Once we know that, we will know how to proceed with the management of that fishery. Yep, it was a sad day for the Olive Creek Reservoir fishery, but there will be better days ahead. 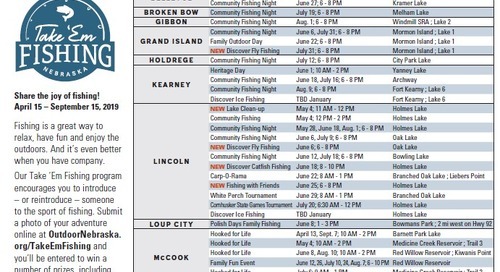 The post Summer Kill appeared first on NEBRASKALand Magazine.